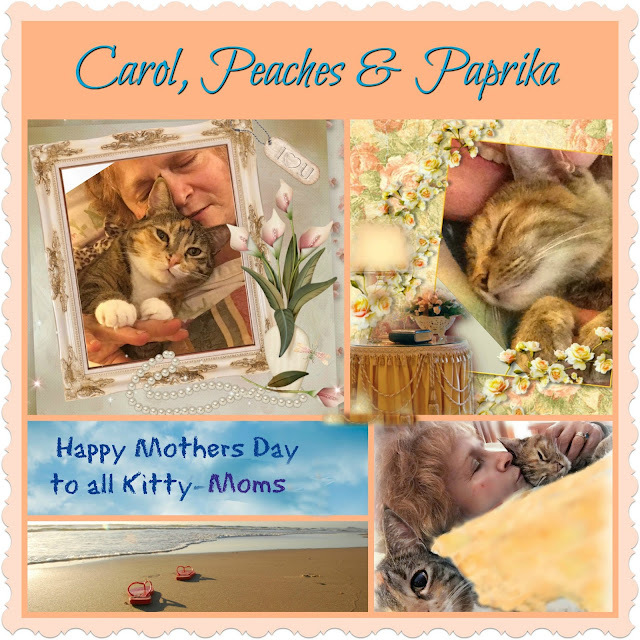 Peaches and Paprika: Happy Kitty-Mom Day! Happy Kitty Momma Day to all our Furrr-iends! Peaches, here! We have our own territories carved out on our human's snoozing quarters. I get the right side (natch), Paprika gets the left. We got it good, right? We want to wish all kitty AND human moms a wonderful day today. Mrrrrowwww! We are joining Cat on My Head's Sunday blog hop - we have heard we have visitation rights there! A great selfie for this special day. Wishing your mom a very Happy Mother's Day. Give her extra snuggles today. Happy Mother's Day from our house to yours! Wishing you a happy and furry Mother's Day! You three look so delightful :-) Now I want to cuddle and snooze with ours too!! And a belated Happy Moms Day to yours!